•	Nutrition for children means making sure your child is getting enough nutrients from age 1 through 11. He will grow each year and his needs for nutrients and new textures will change. Nutrients are calories, protein, fat, vitamins, and minerals. 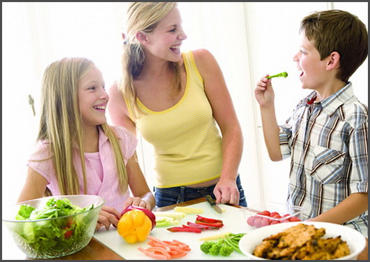 Giving your child a healthy diet is vital so he can grow, develop, and stay at a good weight for his age. 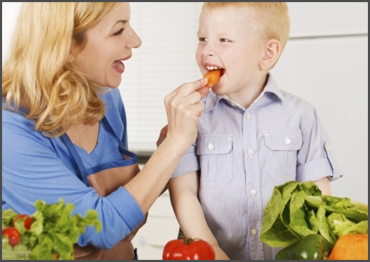 Children learn by watching, so your example is important in teaching good food habits. 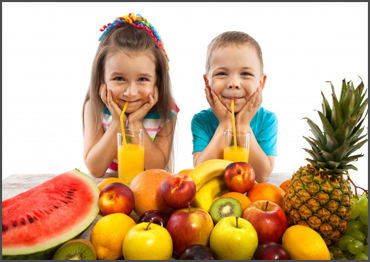 •	Children may not want to eat at times, or they may want to eat too much of the wrong foods. Avoid using food to punish or reward your child. Try to find other ways to change their bad behaviors. Create a relaxed and happy setting for meals. The ideas below can help you guide them to eat a healthy diet that keeps them active and growing during their childhood years. Children this age are very active. Their bodies need nutrients on a regular basis, even if they do not feel hungry. Offer them meals or snacks 4 to 5 times a day. This will make sure that they have enough fuel to play and grow. Take your child for regular check-ups to make sure he is growing at the proper rate. Your caregiver can help you figure out if your child's calorie intake is too high or to low for his age and size. 1) NUTRIENT NEEDS: The amount of calories and protein that your child needs depends on both his age and weight in kilograms. Divide your child's weight in pounds by 2.2 to figure out what he weighs in kilograms (kg). c) Vitamins and Minerals: Your child does not need to take extra vitamins or minerals if he eats a balanced diet. Ask your caregiver before giving your child any vitamin or mineral supplements. a) By age one, your child should start to feed himself by hand. Sometime he may be more interested in the world around him than in eating. 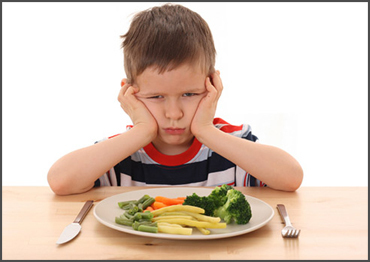 Changing the texture (feel), shape, and taste of foods will keep him from getting bored and refusing to eat. b) By age 2 or 3, your child may have strong food likes and dislikes. These may change every week or so. This is not a problem unless your child stops gaining weight or growing. Give a wide variety of foods to your child. Urge him to eat several things from each food group every day. c) By age 4 to 6, your child may need a lot of time to eat. Playing with toys or other children may distract them from meals. If they will not eat certain foods, do not make an issue of it. Simply try each food again in a few days or a few weeks. If your child refuses a meal, try again at the next snack or mealtime. d) By age 7 to 11, your child will usually eat according to his appetite. When hungry he will eat enough to maintain his weight and energy level. Praise his good eating habits but just ignore bad eating behavior at meals. a) Give your child at least one serving per day of a high vitamin C food. Examples are citrus fruits and juices, tomatoes, potatoes, and green peppers. 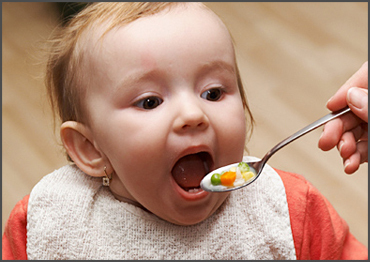 Your child also needs one serving per day of a high vitamin A food. This includes spinach, winter squash, carrots, or sweet potatoes. b) Some children may have trouble swallowing peanut butter at first. Give them only smooth peanut butter up to age 3 or 4. Watch them when they eat this and other sticky food to be sure they can swallow without choking. c) Until age 2, your child should have whole milk and full fat dairy products to make sure his nervous system grows well. d) Give your child 2% milk and low fat dairy foods after age 2 to limit saturated fat intake. Also, choose lean meats, fish, and poultry foods for your child. Avoid fried foods and high fat desserts except on special occasions. Is it okay for Kids to Diet? When someone diets to lose weight, the person is trying to eat fewer calories than the body uses. By doing this, the person may lose body fat and decrease his or her weight. Likewise, if a person eats more calories than the body uses, the person may gain weight. Kids usually do not need to diet in this way. What Foods to feed a Toddler? What not to Feed a Toddler? •	Slippery foods such as whole grapes; large pieces of meats, poultry, and hot dogs; candy and cough drops. •	Small, hard foods such as nuts, seeds, popcorn, chips, pretzels, raw carrots, and raisins. •	Sticky foods such as peanut butter and marshmallows. What Foods should Kids stay away from? Why would a Child Lose Weight?